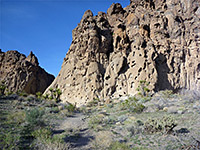 The Rings Trail is by some distance the most popular path in Mojave National Preserve, partly as it starts right next to the Hole-in-the-Wall information center, and a short distance from the busy Hole-in-the-Wall campground. 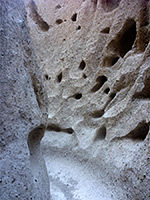 It is also quite unusual, passing through a short slot canyon enclosed by smooth volcanic rocks, where progress is assisted by sets of ringbolts in two steep places - obstacles that are easy for seasoned hikers to pass, especially downhill (even without using the rings) but present more of a challenge to inexperienced desert walkers. 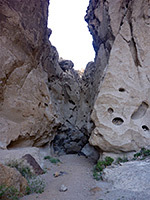 The slot (known as Banshee Canyon) and the surrounding colorful, jagged cliffs account for only 0.2 miles of the 1.4 mile loop; the reminder crosses scenic desert slopes to the south and east of the rocky outcrop, passing a good variety of desert plants, and giving long-distance views across plains and mountain ranges. Map of Mojave National Preserve. 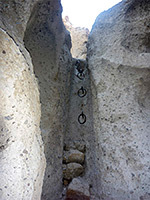 Anti-clockwise seems to be the best direction for the loop, as the exciting rings section is encountered sooner, and the narrows are quicker to explore when descending. 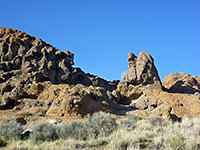 The trailhead is at the end of the side road to the Hole-in-the-Wall information center, which, like the campground just to the north, is lined by high, brownish-grey hills of volcanic rock, eroded into jagged pinnacles on top and large cavities along the cliff faces. 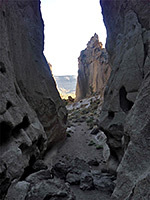 The path enters the upper end of a little wash, past a very short spur to a viewpoint above the narrows, then descends via several short drops into the slot canyon, which cuts through greyish-white conglomerate rocks, worn smooth by occasional floodwaters. 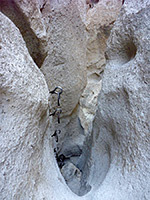 The first ring-aided dryfall is about ten feet high, followed by a deeper channel and then the second, slightly taller drop. Banshee Canyon opens out a bit soon after but stays enclosed a while longer. Moqui steps up a dryfall at the head of a short south-side tributary would give access to another slot-like area, but the climb is not easy. The cliffs soon open up completely, and the south end of Wild Horse Canyon Road is visible not far ahead. The way back to the trailhead is rather longer, another 1.2 miles, skirting the foot of the cliffs on the south side and curving back north to the information center. Plants en route include two species of opuntia and several types of cholla including the relatively rare diamond cholla, while the rocky slopes above harbor many big barrel cacti. There is also a junction, with the longer (6 miles) Barber Peak Trail.